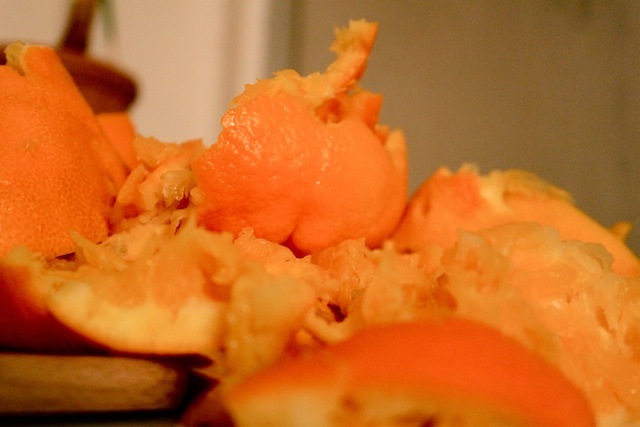 DIY: Orange Liqueur – Eat Me. Drink Me. I find it hard to wake up before eleven. No. That’s not true. I find it hard to get out of bed before eleven. I toss about on my lumpy mattress, attempting to free my sinuses from whatever invisible congestion has beset them from about 8:30 on, snatching fits of sleep, more like consecutive naps, until finally, at eleven, I insist to myself that I must roll out of bed. It’s because I lack goals, I tell myself. Joblessness does not suit me. Instead of using the wide, white expanse of day to do something productive, like apply for jobs or submit stories and poems to literary journals, I fritter away the day doing things like… untagging myself from Facebook pictures. Of course, it isn’t all waste. I do often manage to do one good thing a day – one submission or application, putting together a portfolio – so there is a general swell in the direction I need to go. But out of all of the hours in a day, how little I have to show for them. I need a project, I said (as though applying for jobs were not a project enough). And since I have been meaning to make liqueurs, have even had the jars from Ikea sitting ready, for months, I decided that liqueur-making would be just the thing. 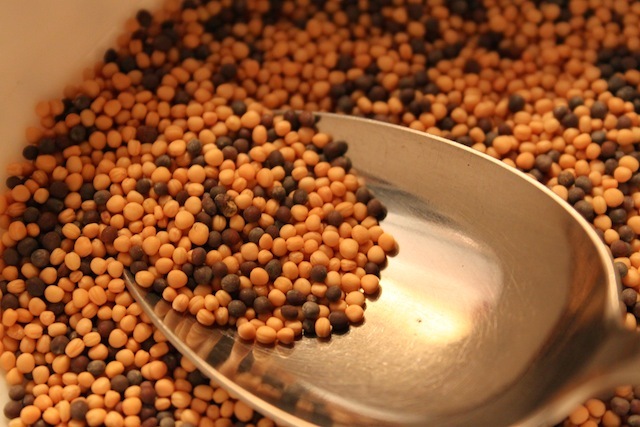 And just for fun, I’d make a batch of homemade mustard too. I first became fascinated with homemade liqueurs a few summers ago while visiting my grandfather on the Schwabian Alb in the south of Germany. There, nothing goes to waste, and the strawberries and rhubarb are turned into jams, the dense purple clusters of elderberries into juice, and bright red raspberries into liqueur. 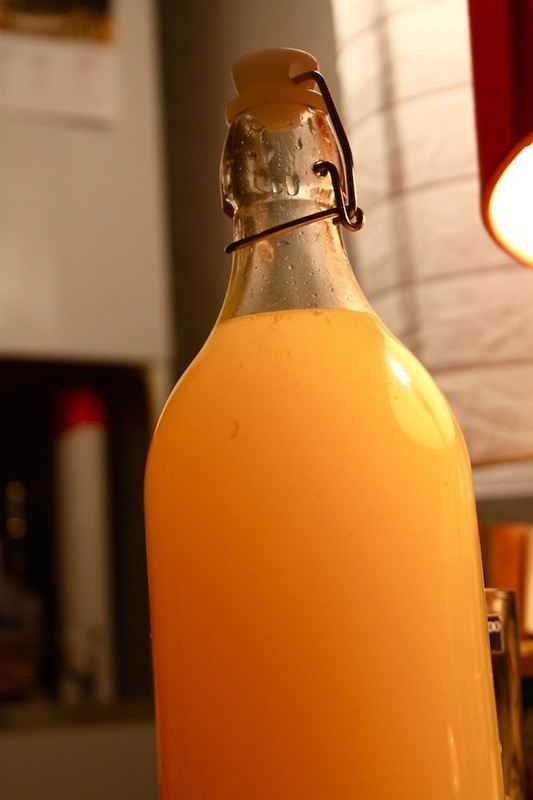 I have been meaning to make my own since then, yet only once managed a successful bottling when I was overcome by the abundance of mulberries hanging on the tree outside my Brooklyn apartment. And even then, one small sample glass and I’d shipped myself off to Germany. At a Goodwill in Pennsylvania, I found a lovely old book called Liqueurs for All Occasions, a fancily scripted tome with aging amber-hued photographs whose opening recipe is for Absinthe. There are some really lovely recipes in the book, some quite intriguing like English walnut, or a cream marsala which calls for eggs. Some of them call for ingredients I’m not sure where to find – like fuller’s teasel (though how delightful), European mountain ash, or yellow plum seeds (under the vague impression these were poisonous). But some sound completely reasonable, like lemon verbena or bergamont, mixed mint or pear. I settled on two fresh, citrusy recipes to warm the winter months – basil schnapps and orange liqueur. Oh, the joy of that smell. 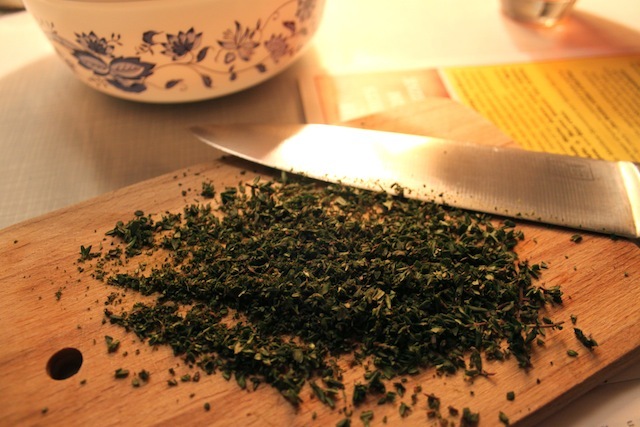 Crushed basil dense like an Italian summer and sticky-bright citrus. 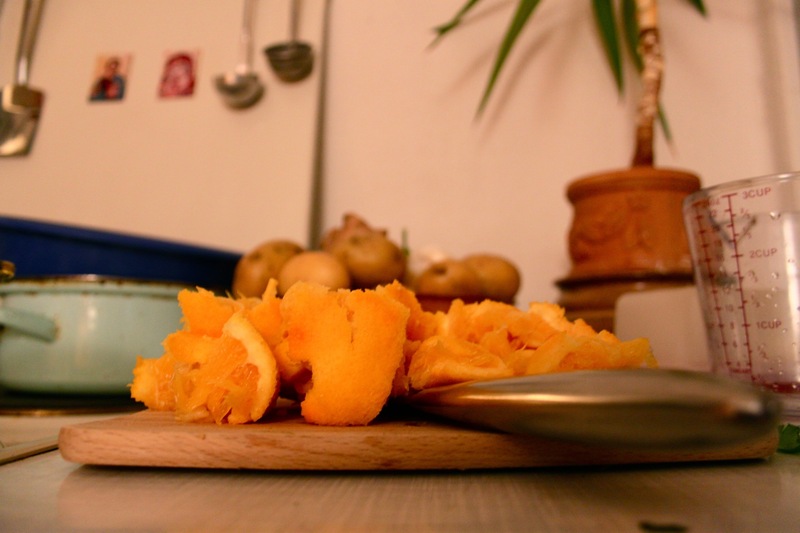 And how lovely to have a project – to press and zest oranges while an orange-flavored simple syrup bubbles on the stove or to watch bright green basil leaves swirl around in fragrant gin. And not to forget my mustard – pebbly brown and yellow seeds mixed with chopped fresh rosemary and thyme. So who knows, maybe I’ll start making a liqueur a month (which means I’ll have to make another trip to Ikea for bottles…) or expand to canning, pickling, curing, preserving, opening my own larder in Berlin… or not. I think I’ll keep the DIY projects to a manageable amount to keep me focused on the other things I need to do, not to mention give me something to look forward to, a reward for having been productive. Look, now I’ve done something today. Zest the peel from two of the oranges and divide in half. 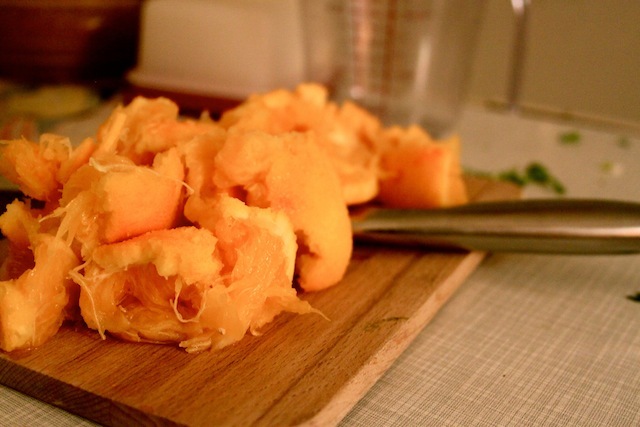 Press juice out of the oranges. In a small saucepan, heat sugar, water, and half of the orange zest to boiling, then reduce to low and simmer for five minutes until sugar is dissolved. Allow syrup to cool. When syrup is cool, add orange juice, stir, and the pass through a mesh sieve to remove pulp. 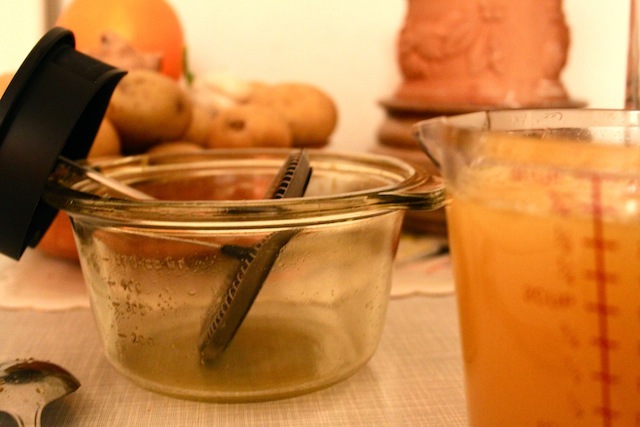 In a clean, air-tight bottle, blend other half of zest, juice/syrup mixture, and rum. Seal the bottle and store in a dark place, shaking occasionally. The liqueur is done after about 4 weeks. Is this similar to Uncle Ronnie’s home made beer making? I’ll take one orange liqueur, please, when you go into business. I will have to try your recipe as I have ventured in to the world of micro brewing which brings me great joy – not only the smell of the intoxicating mixture that I make but watching it bubble as the yeast does its magic, the aging process, the bottling, the natural carbonation in the bottle, more aging in the frig, and finally to open a bottle and sip the illicit drink (once in America and still in many parts of the world) knowing I made it. After making some 15 different batches of beer, I have skunked about five (undrinkable by even my standards). Only three have prevailed but now I have ventured into cracking the grain and boiling the mixture for hours as my home fills with the aroma of a brewery – my future calls. I do believe the goal isn’t to manufacture many different beers or liquors but to find the two or three that bring you the greatest joy – and fewest headaches (in more ways than one). When I come back to the states, you’ll have to give me a crash course in home brewing. Sounds like a good new project for me!